Indian Motorcycles Chandigarh dealership now open | IAMABIKER - Everything Motorcycle! 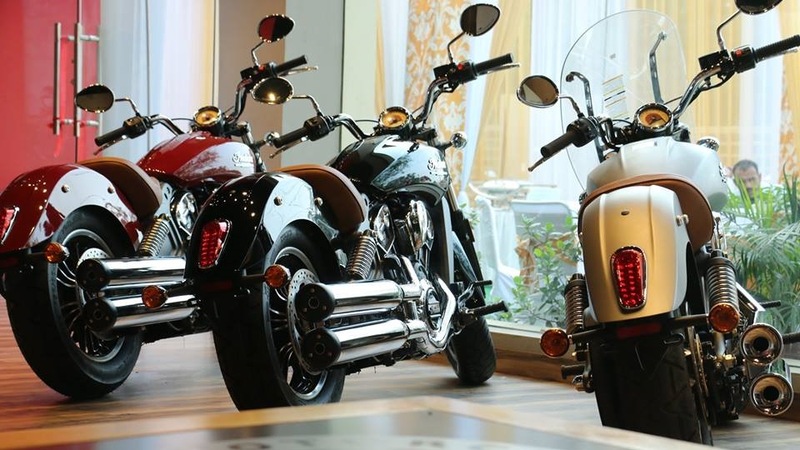 Indian Motorcycles has opened its seventh sales outlet in the country at Chandigarh, which is the capital of the states of Punjab and Haryana. The new facility will display the flagship models from the company, namely, Indian Chief Classic, Indian Chief Vintage, Indian Chieftain, Indian Chief Dark Horse, Indian Scout, Indian Roadmaster and the all-new 2016 Indian Scout Sixty. The dealership has been set up in partnership with ASCO motors, who are established in the motorcycle sales business and operate various Royal Enfield dealerships in the city of Delhi. The showroom was inaugurated by Pankaj Dubey, managing director, Polaris India along with Ravi Babbar, vice president, ASCO Motors. Polaris acquired Indian motorcycles and engineered an all-new engine, the Thunder Stroke 111. The Thunder Stroke 111 is the engine that powers the new platform of motorcycles. Indian motorcycles also brought out the company’s first liquid-cooled engine to power the new Indian Scout, whose name was revived after many decades. “Well-heeled and upwardly mobile professionals in and around Chandigarh have rich global exposure and they have evinced keen interest in premium bikes after returning to India. Through this dealership we want to provide the sophisticated client base in Chandigarh an unparalleled experience in sales and after sales service,” said Ravi Babbar of Asco Motors. Indians’ current line-up comprises of nine models. The Indian Scout and Scout Sixty are the entry level models with the liquid cooled engines. The Chief Classic and the Chief Dark Horse, the Chief Vintage and the Springfield are the full bore tourers. The Indian Chieftain and the Chieftain Dark Horse are the bagger variants, and the Roadmaster is the flagship tourer. Indian motorcycles have a classic styling, garnished with plenty of chrome and leather tassels that hark back to the vintage models. Indian motorcycles have witnessed good sales in the past few years and are expanding aggressively in India.